A former senior judge has criticised the Federal Government's anti-terrorism legislation, saying it establishes a "secret regime". 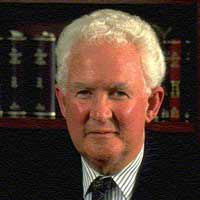 Former Family Court chief justice Alistair Nicholson will outline his concerns at Melbourne University today. Professor Nicholson does not believe the Government has demonstrated a proper need for the legislation. He says some judges may refuse to sit to hear applications under the law, or may regard the legislation as unlawful. Professor Nicholson says the bill is the antithesis of the rights and liberties of Australians. "Had there been a bill of rights and had there been a bill of rights framework, the legislation would have had to be introduced within that framework," he said. "I mean, I'm not saying that we don't need to take action against terrorists but what I'm saying is in effect we don't have to throw out the baby with the bath water and get rid of all of our rights and liberties as we do it. [But the draconian laws are not about terrorists anyway! These laws are about using 'scapegoats' preferably Muslims, to help bolster 'support' and to 'quell dissent' for the 'Coaltion of the Killing's' resource wars in the Middle East. Nicholson: "It just seems to me to be quite unacceptable to have this sort of secret regime that's set up under this legislation which involves perhaps to a greater degree than it previously did, judicial review but it's not a genuine judicial review, it doesn't carry with it rights of appeal, it's all done in secret."